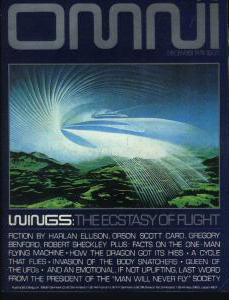 I was excited to learn, via BoingBoing, that “The complete run of Omni… is now available for free on the Internet Archive.” So I eagerly went there, hoping to find two pieces of mine published early in the legendary magazine’s run. The first (there on the left) ran in December 1978 and the second ran in August 1979. I recalled both in Remembering the Future, a little over three years ago. Learning the whole thing was online meant I could finally add these old analog pieces to my digital oeuvre. Alas, it appears that December 1978 is the only issue not in the Archive. At least the second piece, titled “Vagabond,” is there, on pages 55 and 56 of the August ’79 issue. As with the first one, I was paid $800; but I gave much of it to Ray Simone, my good friend and business partner, who did the orignal art, which OMNI knocked off without attribution. Somewhere in my Santa Barbara basement is a copy of the December ’78 issue. I’ll try, sometime in the next few months, when I have a few spare hours to go digging, to find it and send it along to the Internet Archive: the last piece of a fine puzzle. TYVM for this pointer. I loved that magazine, still have some of the earliest kicking around in my library. The issue exists, but Harlan Ellison has requested his story not be reprinted, so the issue is not up. I’ve not generated a version with his stories excised. Thanks, Jason. It’s not a pressing matter. I look forward to seeing it when it’s up though.